Thermoelectric cooler (TEC) modification for SMT (Surface Mount Technology) process generally is not something new to develop. TEC Microsystems has been successfully using it in various projects since 2012. 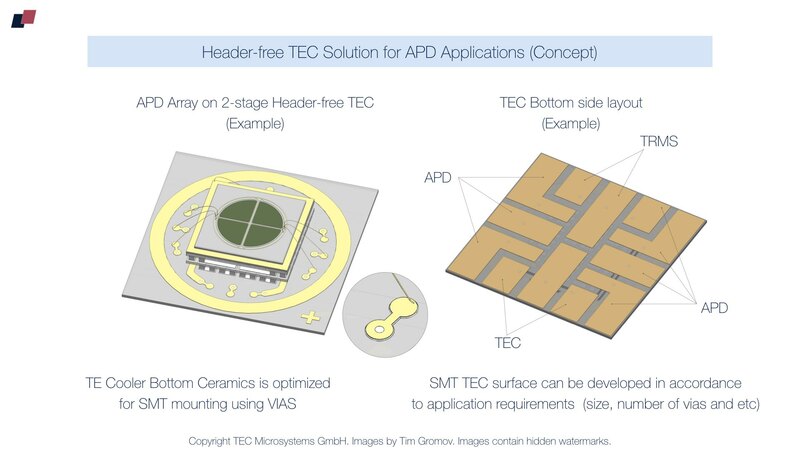 Technically it’s a simple transferring of TEC terminal contacts to the outer surface of TEC bottom ceramics using vias. It is a simple modification, that can turn any TEC into a surface-mount device (SMD), so it can be placed directly onto the surface of printed circuit boards (PCBs). In some applications it saves space and money, and simplifies TEC mounting process. 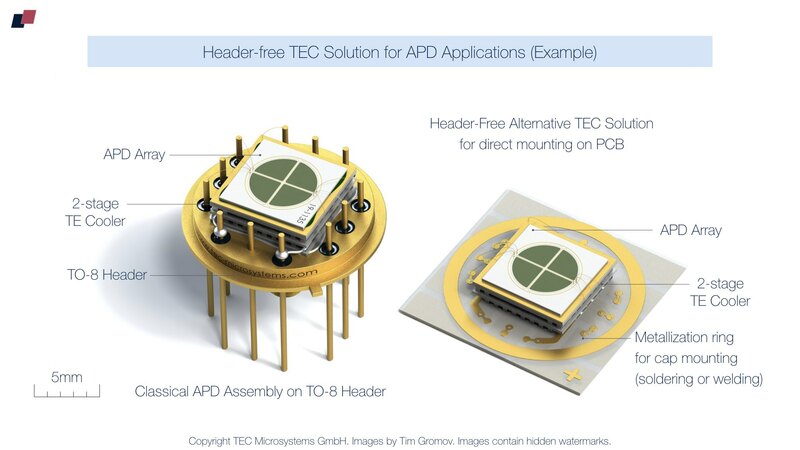 And it is possible to move further and optimise not only the thermoelectric cooler itself for SMT process, but to create a complete SMD solution basing on TEC and the object to be cooled, whether it’s some laser diode or optoelectronics component. 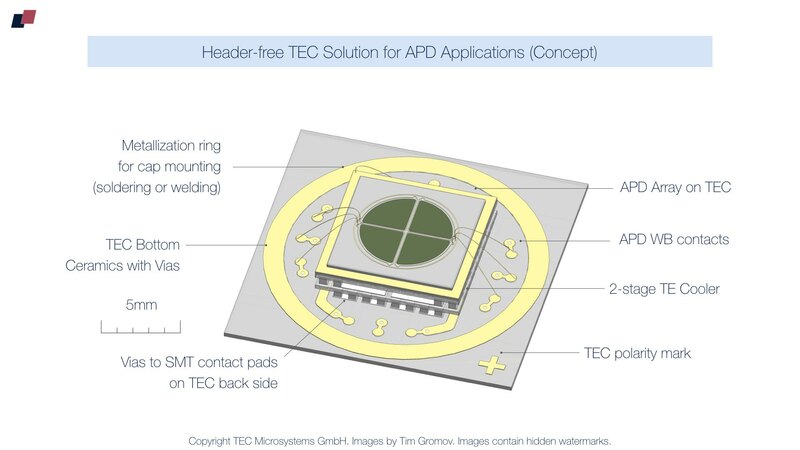 This means to transfer not only TEC terminal contacts to TEC bottom ceramics plate, but also all the terminal contacts of the object to be cooled. The best example is VCESL chip or VCESL array with the integrated temperature stabilization using thermoelectric cooler. The classical solution is to place VCSEL chip on a thermoelectric cooler, TEC then is attached to some header or package, and this assembly is mounted using some socket on PCB. Header (or package) plays here a role of terminal and thermal interface with an easy sealing capability using a standard windowed cap. 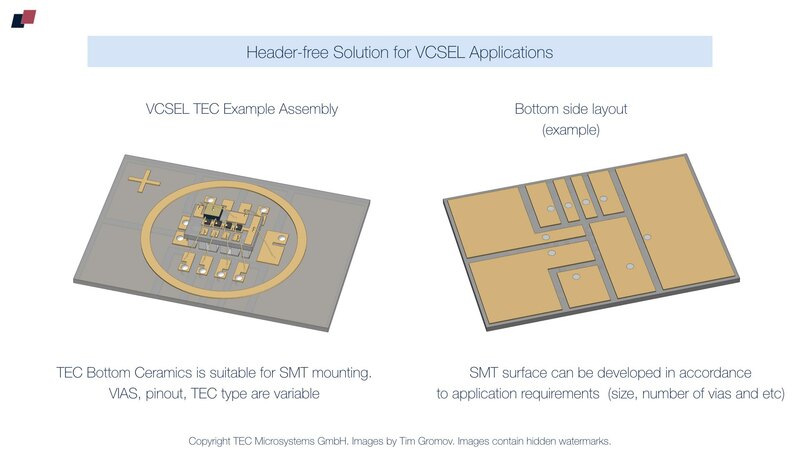 But it’s possible to create a sealed VCSEL solution with TEC only and turn it into SMD unit - a kind of VCSEL “header-free” solution. 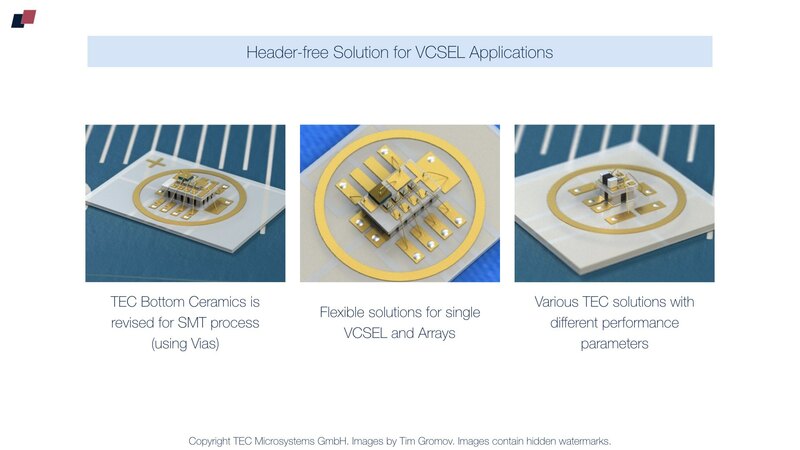 The solution is simple - TEC bottom ceramics (hot side) can be modified with vias for TEC and VCSEL chip or array. 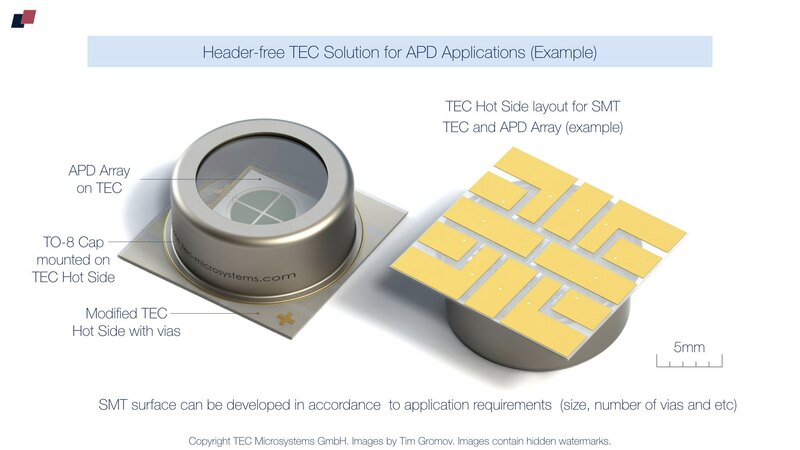 And the cap is mounted directly on TEC ceramics instead of a classical solution with header. This concept was introduced by TEC Microsystems GmbH back in 2015 and successfully implemented in some commercial projects. It’s perfect for VCSEL applications because of low amount of heat to dissipate in operating mode. It simplifies assembly process and reduces costs for the complete unit up to 30-40% just simply because of skipping a header and related mounting processes. Technically this “header-free” solution can be implemented in any application with a required controlled environment (sealed with cap). The cap is mounted on TEC ceramics plate with all terminal connections transferred to TEC ceramics outer surfacer using vias. 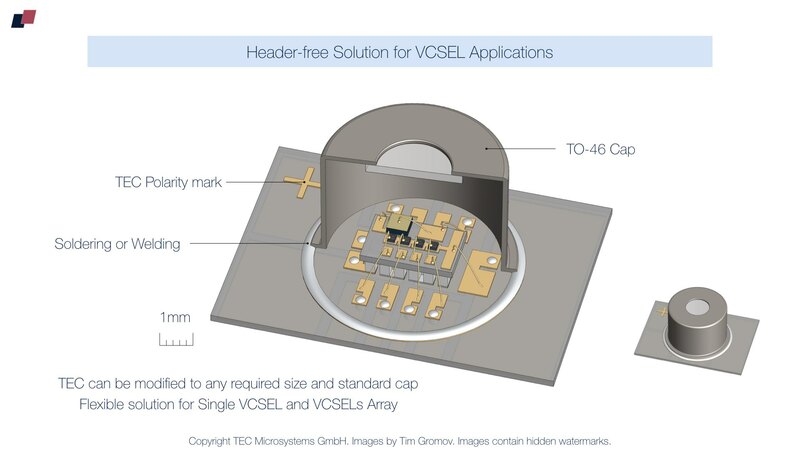 The limiting factor here can be in thermal resistance of PCB, where such “header-free” TEC solution is mounted. But in applications like IR- or X-Ray detectors, or APD for example, the total amount of heat to dissipate in operating mode is quite low, and in case of optimal thermoelectric cooler choice even with a direct mounting on standard PCB it’s possible to run the assembly without an overheating. Below is the example of “Header-Free” thermoelectric cooler solution for APD arrays. The classical APD form-factor here is based on TO-8 header with single- or 2-stage thermoelectric cooler. Switching to the “header-free solution” requires a modification of thermoelectric cooler hot side. 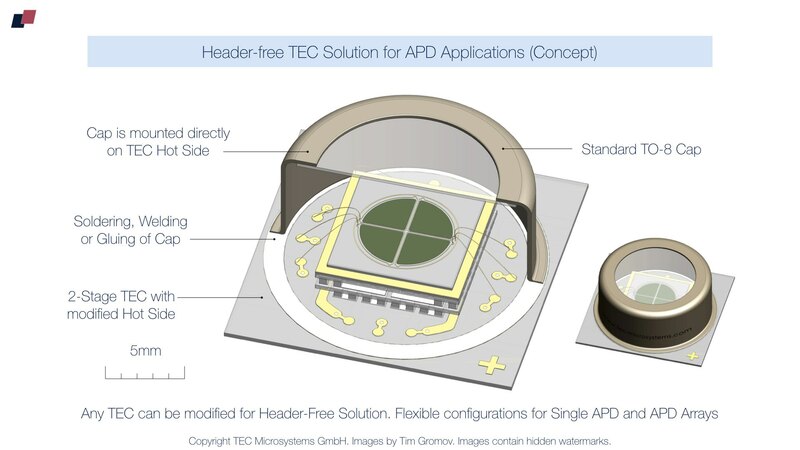 TEC remains the same by performance, APD array terminal wires are connected to TEC bottom ceramics, the cap remains the same. The resulting solution is more compact, has less mounting procedures and is less expensive. And it's optimal for SMT process with mounting on standard or ceramics PCB, or in ceramics packages. 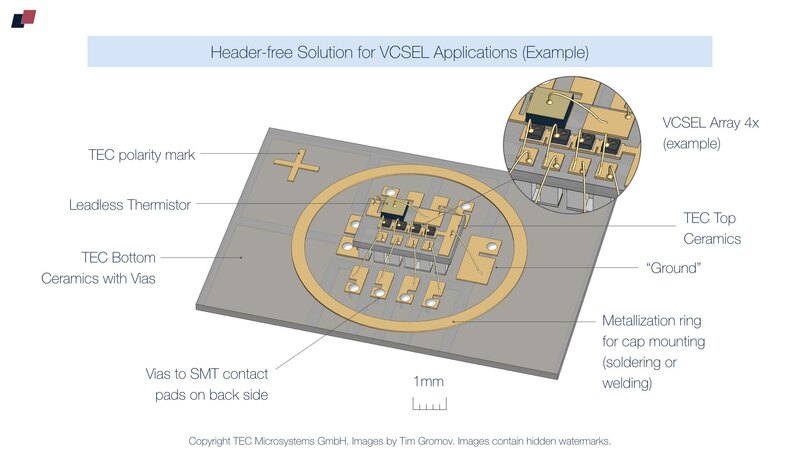 The entire solution becomes SMD, easy for integrating and allows to skip a header in design. The main focus of such concept is on applications with low heatload and related heat dissipation from thermoelectric cooler. 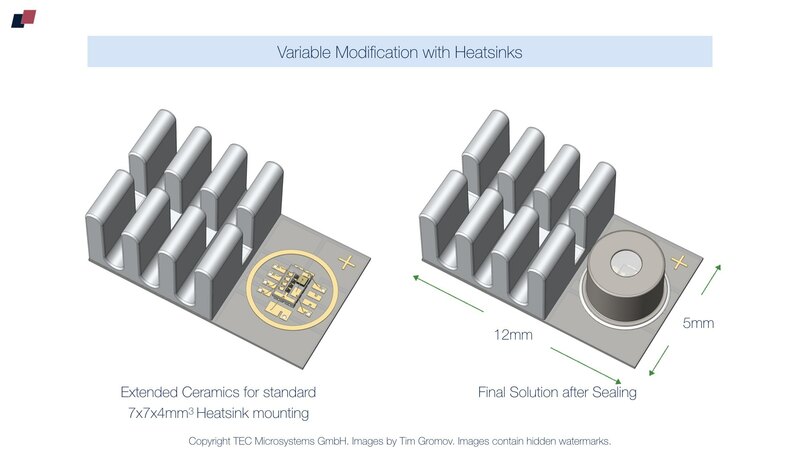 Optimal thermoelectric coolers in VCSEL applications or IR- detector applications consume less than 1W of electrical power, which means mounting on standard PCB is not a problem in terms of heat dissipation. 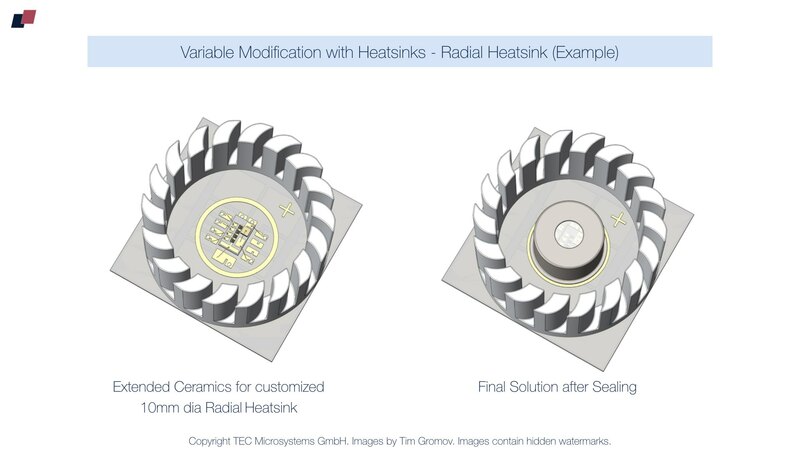 Also with certain adjustments in thermal design, like extended hot side area, a heatsink integrated on TEC hot side, or mounting on ceramics PCB or in ceramics package, these "header-free" TECs may work in applications with relatively high heatload level. 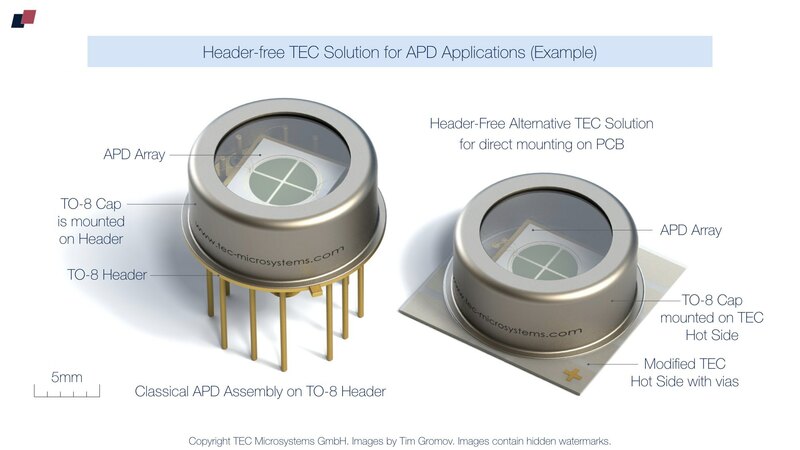 TEC Microsystems GmbH is fully flexible with modification of any standard thermoelectric cooler from its nomenclature into SMD device or a complete “header-free” TEC solution. TEC ceramics material can be AlN or Al2O3, thickness can be 0.25mm, 0.5mm or 1mm if required. The metallization patterns and vias have no limitations excepting 100um min recommended distance between Au plated zones. 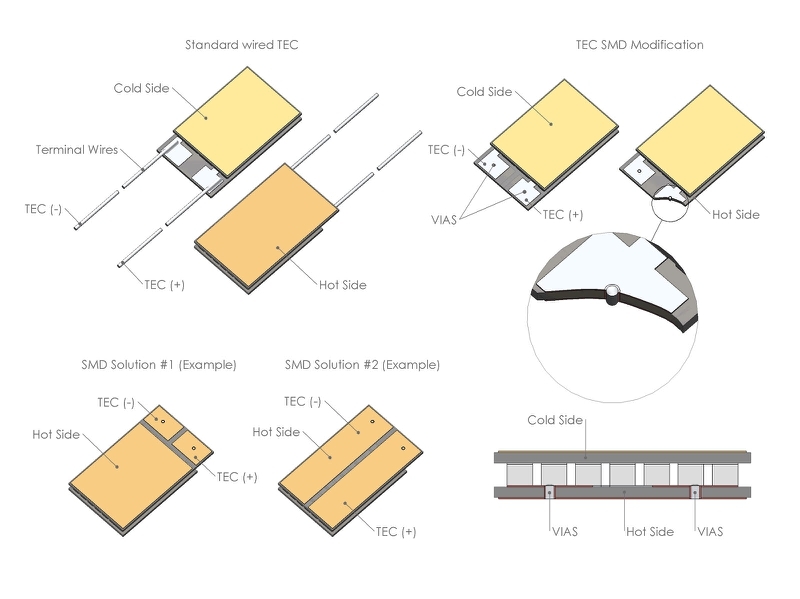 Additional information about header-free thermoelectric coolers concept, examples, TEC drawings, performance plots and quick estimations for optimal thermoelectric cooling solution are provided by request.